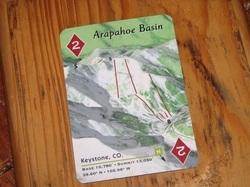 Arapahoe Basin, was fun even with no new snow anywhere to be seen. It was a Sunday, and it was the first time I had seen crowds or waited in a lift line in all of Colorado. I spent the day getting to know A-Basin with Greg (from RI), and two other Pingree '04 grads Peter Glore, and Alex Mic. Both who live in the area now, and put me to shame with their sweet skills. Alex and his roomate Preston were on boards, but it was okay, they could hang. We spent a long time looking for Preston's glove which he thought was lost under the lift, but was actually under a bar stool at the bar at the end of the day. The post-ski deck scene was fun, and since it was sunny and warm, there were dogs everywhere, though Gus did not join us on the deck for fear of her getting excited and "doing her business" where skiers were trying to enjoy their beers. I forgot my camera this day, so I snapped a few shots with my phone. Mostly from the bar. I want you to take note of the PBR special: 4.50$. I love PBR but for 50 cents more I went for a slightly higher end beer, a coors light. I also snapped the Raw Bar at the base and the shot-ski.